According to the Bureau of Labor Statistics, the health care industry should see a 33 percent growth this decade, with up to 5.7 million new jobs. Of the 20 fastest growing careers, eight are in the health care field. With the enormous growth in this sector, why is it so difficult to find places to purchase scrubs other then on the internet? Why are there such limited options when there is such a high demand? Several years ago when I first started our medical supply business, I was approached by someone who wanted to know if we sold scrubs and could bring them to their doctor office for a scrub sale. Up until that point, I had never heard of the concept of a scrub sale but I thought what a great idea. We have had a home care business since 2003, but I really never thought about where our caregivers purchased their scrubs. The idea of bringing scrubs to a facility or office sounded interesting but I wanted to know what other options were currently available for those in the medical field. I began looking around to see what options were out there for people purchasing scrubs other than the internet. What I found was amazing. There were very few scrub stores even in business. Many people traveled 45+ minutes to get to the closest scrub retail store where they were forced to pay $50-$70 to put a full set together. Not only were they paying an “arm and leg” for gas to get there but then they had to pay exorbitant amounts for the scrubs. The only other place that I could find that carried scrubs were some of the department stores but they had a very small section of scrubs and the prices were not much better. If you wore plus sizes or needed tall or petite pants, then you were completely out of luck. With the limited availability of options and the skyrocketing gas prices, the idea of bringing scrubs into a facility or doctor office seemed to be a great option. We began bringing scrubs to facilities by wheeling in the scrubs on racks and utilizing the conference room or activity room of a facility. What I found was that this was a very cumbersome process which disrupted many of the places we went to. The set up time was long and it wasted valuable space at the places we were going to. The other problem was that you could not bring in enough of a selection and there was no place for someone to try on the scrubs. The question became “how do you hold a scrub sale with the least amount of intrusion on the place you are going to?” That was when we stumbled upon the answer, a mobile scrub store. 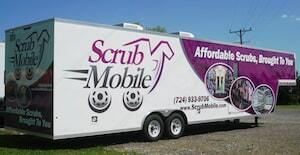 With a mobile scrub store, you are able to pull into the parking lot of a facility and be ready to sell scrubs without the long set up and tear down times. There is no need to tie up valuable space at a facility or disrupt the residents/patients. The employees simply walk out to the mobile scrub store on their break or lunch time. They can pick out their items, try them on in the dressing rooms and check out, all in the comfort of the mobile store. What a novel concept. We found that this was a great way for companies to show their appreciation of their valued employees without all the disruptions of the typical scrub sale. Not only does it allow their employees to get low cost uniforms but it allows them to spend less of their time away from their families. What a remarkable way to outfit a growing sector. Erin Carll is the co-owner of North Hills Medical Supply and the Scrub Mobile which is currently located in Wexford PA but will be relocating to 9551 Babcock Blvd Allison Park, PA on August 1st. The office phone number is 724-933-9706 and the website is www.ScrubMobile.com.